Wrangler® and Lee® are using some unconventional techniques in their latest lines of denim – and they’ve used VF’s consumer insights, scientific research, and textile and design innovation to do it. The challenge? To come up with a “cooler” line of denim for two very different customers – Chinese consumers and working men in the Southwestern United States. That’s how Lee Jade Fusion denim and the Wrangler Premium Cool Vantage™ jeans were born. There are different ways to make denim. The Wrangler customer, including cowboys from the Southwest, needed heavier denim that would be durable for work. 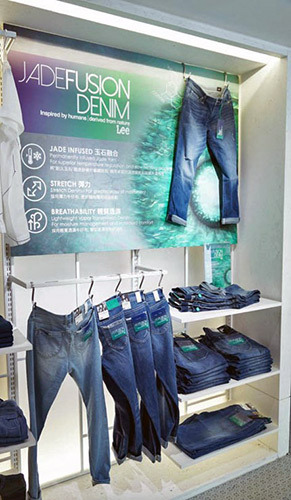 Chinese consumers needed lighter, cooler denim for everyday wear. “Our corporate innovation team worked in collaboration with the brands and a global network of universities, labs and mills to produce the Wrangler Cool Vantage and Lee Jade Fusion lines,” said Dull. Wrangler’s Cool Vantage jeans, which hit store shelves in June, were developed with sweat-control technology that is blended and extruded into a polyester yarn. The new fiber, exclusive to Wrangler, aids in pulling moisture away from the body. The denim is designed to last two times longer and has cooling benefits woven into the fabric that don’t wash out over time. Lee’s Jade Fusion denim’s not-so-secret ingredient is jade stones, which are crushed and woven into the fabric and combined with treated cotton to keep wearers cooler. The technique addresses a need for cool and comfortable jean that combats the humidity and high temperatures in Asia. Jade, a precious stone, also has important spiritual and emotional significance for the Chinese market. A team of experts and scientists tested more than 60 materials for the Jade Fusion line, which debuted in Hong Kong in May. The next iteration of Jade denim, Magma, launched in fall 2015. The products are part VF’s initiative to better understand consumer needs through deep consumer insights and develop more innovative products.